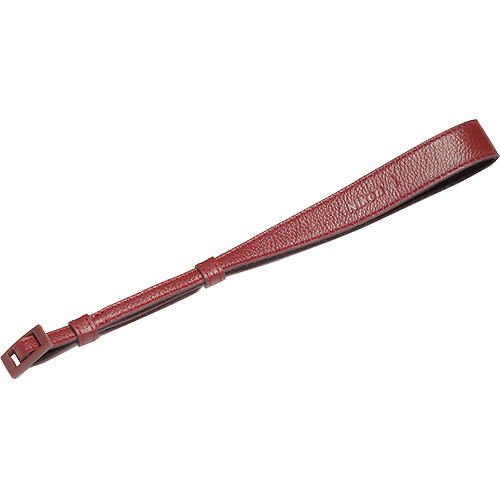 The Nikon AH-N1000 Leather Hand Strap for Nikon 1 Camera (Red) is an optional accessory leather hand strap, custom designed for the Nikon 1 J1 / V1 digital camera. The strap offers you a comfortable, snug hold, whether you're looking for some extra security against drops while you shoot, or just want a trusty way to hold your camera while you're resting or walking to your next location. The Nikon 1 logo is featured. Box Dimensions (LxWxH) 7.75 x 2.3 x 1.5"
AH-N1000 Leather Hand Strap for Nikon 1 Camera (Red) is rated 4.3 out of 5 by 9. Rated 5 out of 5 by Carla from I love this strap for my Nikon One. This is so much better than the neck strap that came with the camera. That one is bulky and cumbersome. This is slick and fits easily into my camera bag. I tested having it on my wrist while photographing in Chaco Canyon, New Mexico and it was handy but not in the way. Glad it is leather too. Won't show the dirt when you have a white camera and white accessories. Rated 5 out of 5 by motoyoyo from Great Wrist Strap I love this wrist strap. It has the perfect proportions and mounts nicely to the camera pivots. I only wish they had a generic model because I couldn't find another strap as nice for my OMD EM10. I bought another one anyway for my Oly. Rated 4 out of 5 by JackRack from No Drop Strop I use this as a camera strap for my Fiji X E-1. It is comfortable and handles the weight just fine. The only draw back that I can see is that there is no quick release mechanism. Getting it on and off is rather laborious. Rated 5 out of 5 by Arthur from Nice leather strap by Nikon I use it with Nikon 1 J 1 camera. It protects my camera from falling out of my hands and damage. It looks and works great. My only concern is how long it will last since the loop leather is rather thin. Rated 5 out of 5 by UNC-TarHeels from Much better than strap that comes with the camera This is a must have as it makes the camera so much more secure in your hand, easier to carry and improves overall use. Rated 1 out of 5 by Brenda877 from Sorry, I did not like it. I returned the item. It was not what I was expecting. It was stiff and bulky and did not adjust to your wrist easily. Rated 5 out of 5 by Fabers from Good Match Well designed and a good match for the 1 series. I bought a red strap for my black camera and it looks terrific. What are the actual dimensions of this strap? The specs only list the package dimensions. Also, will this fit the Canon SL1? I contacted Nikon, and unfortunately, they state that no information or specifications are published on the AN-DC12 neck strap except that it is compatible with the Nikon 1 series cameras. I have not been able to find the dimensions of the strap anywhere online. Due to the similarity in the camera strap lugs on both cameras, it appears the strap may fit for use on the Canon EOS Digital Rebel SL1 DSLR camera.